Iñaki Aldasoro, Ester Faia, Gerardo Ferrara, Sam Langfield, Zijun Liu and Tomohiro Ota. We make the case for a macroprudential approach to liquidity requirements in the cross-section of banks. Currently, the liquidity coverage requirement is applied uniformly across banks. This microprudential approach overlooks externalities: owing to their size, complexity and position in the interbank funding network, some banks can cause inordinate damage to the rest of the banking system. When externalities are taken into account, we show that these systemically important banks should be subject to more stringent liquidity requirements. This cross-sectional macroprudential approach promises “more bang for the buck”: systemic risk can be reduced without increasing the stringency of liquidity requirements for the banking system as a whole. There is broad recognition that microprudential policy is not enough to contain systemic risk. Stability at the bank-level does not ensure stability at the system-level, since certain banks generate externalities that impede other banks and the system as a whole. To address externalities, legislators have adopted a macroprudential approach to bank capital requirements. In Europe, the Capital Requirements Directive (CRD) IV provides for extra capital buffers for global and other systemically important institutions (Article 131). Authorities may also impose a “systemic risk buffer” on certain banks (Article 133). The liquidity coverage requirement obliges banks to hold liquid assets, such as cash and sovereign bonds, to cover net liquidity outflows over 30 days of “gravely stressed conditions” (CRR Article 412). The LCR is currently being phased-in, and is expected to be fully in place by 2018. The stable funding requirement will oblige banks to fund long-term assets with long-term liabilities, such as customer deposits,long-term wholesale funding and equity (CRR Article 413). The NSFR is not yet enforced in Europe. These microprudential liquidity requirements are crucial to offset the moral hazard generated by backstops such as deposit insurance and central banks’ lender of last resort facilities (Ratnovski, 2009; Farhi and Tirole, 2012; Stein, 2013). By enhancing individual banks’ resilience, they also play an important role in reducing systemic liquidity risk. Our research shows that systemic liquidity risk can be lowered further by taking externalities into account when calibrating liquidity requirements – analogously to the current approach to capital requirements. By skewing liquidity requirements towards systemically important banks, macroprudential authorities can limit the outsized contribution of these banks to liquidity contagion. Authorities in Europe can already adopt a macroprudential approach to liquidity policy by taking into account “systemic liquidity risk” when imposing bank-specific requirements (CRDIV Article 105). These bank-specific requirements can be applied equally to banks with similar risk profiles (CRDIV Article 103) – delivering a macroprudential overlay to bank-specific Pillar 2 decisions. In future, the European legislator could consider elaborating the modalities of macroprudential liquidity requirements in European law. In separate papers, Aldasoro and Faia (2015) and Ferrara, Langfield, Liu and Ota (2016) investigate a common policy question: how should liquidity requirements be distributed across banks to minimise systemic risk? The microprudential reply implicit in the current calibration of the liquidity coverage requirement is: “all banks should be subject to the same requirement”. According to this view, all firms must hold sufficient liquid assets to survive net liquidity outflows over 30 days. This uniform requirement does not discriminate between institutions. Our macroprudential reply is: “bank-level requirements should be a function of banks’ systemic importance”. Banks that contribute more to systemic liquidity risk should be subject to more stringent requirements than less important banks. We are not the first to highlight the merits of macroprudential liquidity requirements. The European Systemic Risk Board argues that macroprudential liquidity requirements could help to prevent and mitigate the vicious spirals of illiquidity that characterised the 2007-09 banking crisis (ESRB, 2014; Clerc et al, 2016). In a formal setting, Gai et al (2011) show that skewing liquidity requirements towards systemically important banks, while holding the average liquidity requirement constant, can reduce systemic risk. Similarly, Perotti and Suarez (2011) show that optimal liquidity regulation is a function of banks’ systemic importance, although their chosen policy instrument is a Pigovian tax on short-term funding rather than quantity-based requirements. Others take distinct but complementary macroprudential approaches by considering time-varying requirements (ECB, 2014; Bonfim and Kim, 2014; Dijum and Wierts, 2015) or even entirely new quantity-based instruments (Hardy and Hochreiter, 2014). Motivated by these high-level insights, we develop two models to evaluate and calibrate macroprudential liquidity regulation. The remainder of this post describes these two models and highlights their main results. Aldasoro and Faia (2015) develop a network model featuring contagion on both the asset and liability side of banks’ balance sheets. In this model, banks optimise their balance sheet structures subject to regulatory constraints. Interactions between banks take place directly, through interbank interconnections, and indirectly, via common exposures to external illiquid assets. Both types of interconnections can serve as channels of distress propagation. On top of these two channels, the model captures liquidity hoarding and endogenous bank runs triggered by information coordination (akin to the global games literature). When external assets are hit by shocks, all contagion channels interact with each other to generate systemic risk. The model is calibrated to the European interbank network (Alves et al, 2013) by a simulated method of moments approach. In this setting, three policy regimes are compared: one with no liquidity requirement; one with a microprudential requirement, which is uniform across banks; and one with a macroprudential requirement, in which more systemically important banks are subject to higher weights on the deposit component of the liquidity coverage requirement. Systemically important banks are identified using BCBS and EBA methodologies. In Chart 1, the three box-and-whiskers show the distribution of systemic risk over 1,000 shock realisations under each of the three policy regimes. The microprudential requirement substantially reduces systemic risk (relative to no requirement). Furthermore, the macroprudential requirement generates a similarly substantial reduction in systemic risk (relative to the microprudential requirement). The latter result is remarkable, since it is achieved only by skewing the distribution of liquidity requirements towards systemically important banks – without any change in aggregate liquidity requirements. Source: Aldasoro and Faia (2015). Each of the boxes summarizes the distribution of systemic risk over 1,000 shock realizations. Red lines indicate the median of the distribution; blue boxes range from the lower quantile (25%) to upper quantile (75%); the whiskers range from minimum to maximum values (excluding outliers, which are captured by the red crosses). Ferrara et al (2016) take a complementary approach by zooming in on the propagation of illiquidity in the interbank funding market. In this market, one bank’s outflow of cash is another’s inflow: failure to roll-over short-term funding or repay obligations when they fall due creates an externality by hurting counterparties’ cash inflows. “Systemic illiquidity” occurs when this externality generates a network effect in the form of cascading funding shortfalls. 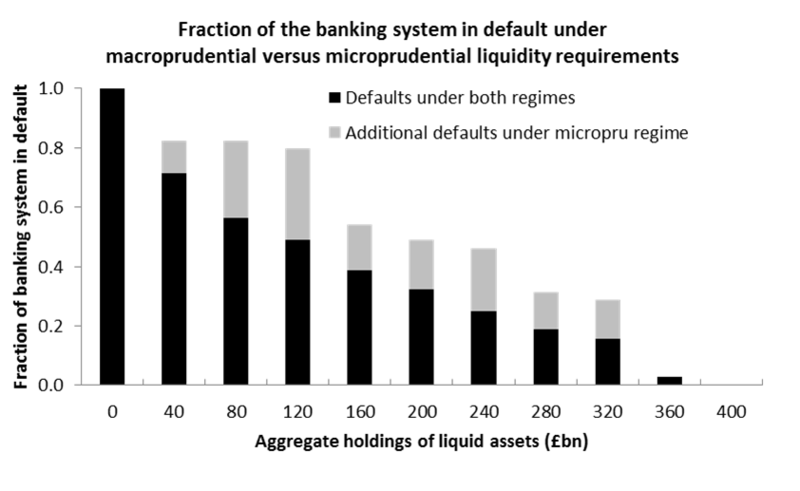 Systemic illiquidity is modelled by extending the dynamic programming algorithm of Eisenberg and Noe (2001) to multiple time periods. The model is applied to Bank of England data on the UK interbank network. In this setting, Ferrara et al evaluate the efficacy of liquidity requirements for different aggregate amounts of liquid assets held by all banks. To mimic the pre-crisis situation, they also scale the size of the interbank funding network. Chart 2 shows the fraction of the banking system in default – for a range of aggregate liquid asset holdings – when the interbank funding network is 300% of its end-2013 size. Systemic illiquidity emerges only when aggregate liquid asset holdings are £360bn or less. By comparison, holdings at the end of 2013 amounted to £724bn. This finding corroborates Aldasoro and Faia (2015) in underscoring the importance of recently introduced microprudential liquidity requirements in improving systemic stability. As aggregate liquid asset holdings are reduced, the fraction of the banking system in default increases. For example, when banks hold £320bn of liquid assets, 28.8% of the banking system would be in default when liquidity requirements are calibrated “microprudentially”: that is, without taking into account externalities and network effects. When we instead consider a macroprudential policy regime, only 15.6% of the banking system defaults – even though the macroprudential regime just changes the cross-sectional distribution of holdings to take network effects into account. The intuition behind this result is that a macroprudential policy regime concentrates requirements where they are most needed – i.e. in those banks whose failure would generate a cascade of non-repayments. Source: Ferrara, Langfield, Liu and Ota (2016). The simulations proportionally scale the interbank funding network by 300% of its end-2013 size to mimic the interbank market before the crisis. 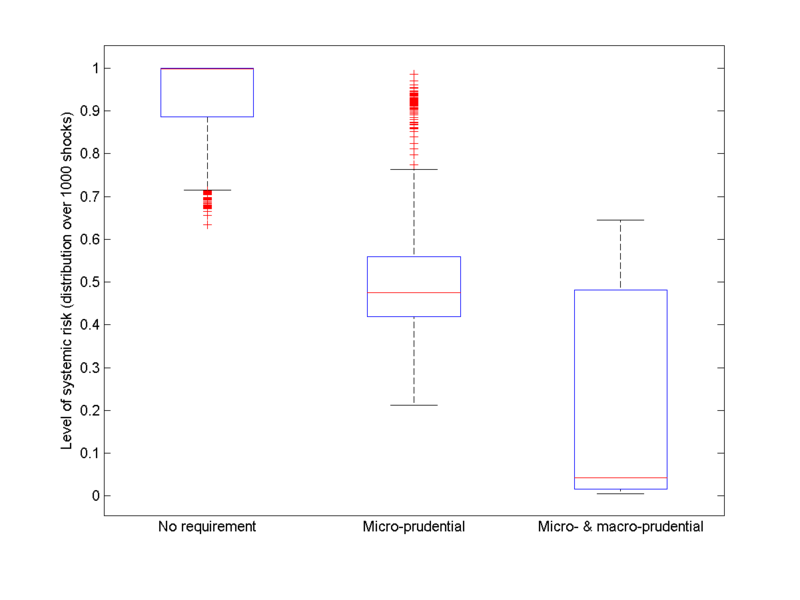 Macroprudential liquidity requirements imply tighter requirements for systemically important banks and looser requirements for less important banks. Aggregate liquidity requirements for the banking system as a whole need not be any different than under the current microprudential approach. The novel insight of our work is that skewing liquidity requirements towards systemically important banks – while keeping average liquidity requirements across the banking system as a whole at the same level – can achieve a substantial reduction in systemic risk. Iñaki Aldasoro works at Goethe University Frankfurt. Ester Faia works at Goethe University Frankfurt and is a CEPR research fellow. Sam Langfield works at the European Systemic Risk Board Secretariat in the European Central Bank and is visiting Princeton University over 2015-16. Gerardo Ferrara works in the Bank’s Financial Market Infrastructure Division, and Zijun Liu in the Bank’s Capital Markets Division. Tomohiro Ota used to work at the Bank of England and now works in the private sector. Previous Post International business cycle synchronization: what is the role of financial linkages?